Could the most unlikely Avengers cameo rumor really be true after all? A horror legend says he wants to play a crucial character on The Walking Dead — and reveals which Oscar-nominated actor the producers supposedly have in mind instead. 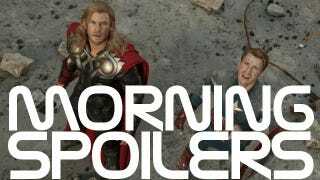 Plus updates on The Dark Knight Rises, The Hobbit, Riddick, and much more! Yup! I know. You saw it, man. The trailer isn't misleading and Nolan's not the type of guy to create a trailer that will sell you something other than what the movie is. "I had a lot of fun with him, it was great. Joss has an extraordinary taste, I think. He's got such a brilliant and irreverent sense of humour but also an incredibly deep knowledge of the comic book genre and a respect for the traditions of how these things are handled." I have tried to explore Peter Parker as an orphan. Orphans, I feel, are the strongest human beings on the planet. The amount of things they have to deal with in their lives, is amazing. I have tried to capture how Peter copes with the feelings of being an underdog, his confusions and his self-doubt . This, I hope, has brought, a certain empathy and sensitivity to his character that explains how it helps him become the hero that he eventually turns out to be. Oh yeah, he's a great moviemaker and a great storyteller... He's a writer too, so every character matters and it's about the fun performances he's trying to get everyone. I mean, Effie Trinket is an amazing character, so we had a great time figuring her out together. I can't wait for people to see it. Here's a teaser for the new promo trailer that will air during the Super Bowl. "I'm a fairly spontaneous actor. I like to keep things fresh and real and alive. And therefore, I don't do a lot of prepping. I can't just be spontaneous, because there is nothing natural about being an elf. It's not human, so I have to study to learn what it means to be this other creature. "So, on top of my stunt training — which I need to learn how to be proficient with the bow and arrow, and with daggers, and in fighting orcs that are, you know, ten feet tall — I also have to learn the language of Elvish, and I have to learn an RP [Received Pronunciation] neutral English accent for when I speak English. [I've spent] four times as much time preparing as I do actually shooting." "Being king has it's perks… yet an alpha Furyan, must return to his primitive state… that animal side. "[It] lasted until [director] James [Watkins] and I were on board. And then we went, ‘If there's a film that does not need 3D, this is it.' I am not enamored of 3D, though I'm sure I'll have to get used to it. If you really think there's something to be gained by 3D, then fair enough. But if you just go, ‘Oh, let's make it in 3D just because everyone's doing it now'-why waste your money? Why charge people more? Unless there is a truly tangible benefit to the film, I don't understand. And THE WOMAN IN BLACK…nothing about it needs 3D. It's the same way I've felt-and I've been quite honest about this in interviews before-about the last HARRY POTTER film, which came out in 3D, and I saw it in 3D once and in 2D once. The 3D was good, but I don't think it added much. It's already a visually impressive film, and it didn't need anything else on top of that. And I hate having to wear those bloody glasses. Now they're doing 3D TVs at home, and I'm just like, ‘I don't wanna sit and wear those glasses at home alone!'" Oh, no, Shazam's always - there's always a possibility for Shazam. There's always talk about Shazam. And I can't get into the specifics on that, but yeah, there's hope for Shazam. "I just sort of take each year as it comes really. We've got all the rest of this year to get through and then we'll just sit down and review it from there and see where it goes. But I love playing the part and I love working with (writer) Steven Moffat...I think there will need to be a younger, cooler person than me - or maybe an older, cooler person, who knows? But I don't think I'll be doing it as long as Mr. Baker." "You're going to see a fair amount of them I think. They're my three little new cast members. We have models that I get to do camera rehearsals with and then there's nothing and I just have to kind of [imagine them]. I was holding a little stuffy toy [at one point], that was about it. "She goes through another different stage I think, kind of coming to the realization of what she's up against and that she's definitely in a man's world. So it's interesting. We have a few new players, there are some interesting ones that kind of make an appearance." Here's a promo for the show's return. You can also check out another one here. Last time I talked to him about it, when I was in Los Angeles, he said they were going after a name for that part. I said, "Who?" He said John Hawkes. Well, I never heard of John Hawkes. But then he reminds me that we were in From Dusk Till Dawn together. He is the guy at the beginning in the store that fires on them. Apparently he was up for an Academy Award. He was up for something called Winter's Bone. That's whom they are going after for The Governor. But everyone I talk to, the people that read the graphic novels...They've all said that I would be the perfect governor. Because he is tough and brutal. DAVID AGREES TO TELL KATHRYN ABOUT HIS RELATIONSHIP WITH MARY MARGARET AND END HIS LOVELESS MARRIAGE, AND PRINCE CHARMING AIDS ABIGAIL ON A DANGEROUS MISSION TO RECOVER SOMETHING SPECIAL THAT WAS LOST TO HER, ON ABC'S "ONCE UPON A TIME" - Alan Dale ("Lost") Guest Stars as King George - With their love for each other growing stronger, David finally agrees to tell Kathryn about his relationship with Mary Margaret and put an end to his loveless marriage. Meanwhile, in the fairytale land that was, while runaway groom Prince Charming searches for Snow White, he agrees to aid Abigail on a dangerous mission to recover something precious that was lost to her. Here's a pair of sneak peeks for this Friday's episode and tenth overall, "Organ Grinder." You can also check out another one here. "This is not one of those revenge-against-men-type stories. She's a black widow who is facing a very difficult inner struggle. She's doing what she must to survive." "They killed everyone, just clambered over the bodies. We lost the city." "Do you really call it Rentaghost? That's just stupid." "Come with me. Don't come with me. You've all got tickets for the Titanic either way." "No, you're good cop remember. Like we rehearsed." "You're the Lone Ranger, you're a hero." "I'm going to save the world." Here are two sneak peeks and the official description for the next episode, "The Box", which airs this Friday. Which bounty hunters will be the last ones standing? It's a tournament of champions, Star Wars-style, in the next all-new episode of The Clone Wars. Obi-Wan Kenobi is still deep undercover as the criminal marksman Rako Hardeen, and he's done such an impressive job that he's qualified for Count Dooku's ultimate test: surviving the Box. The Box is a technological marvel, a reconfiguring obstacle course where sloppy players are eliminated, because Dooku needs the best if he's going to carry out his wicked plot to kidnap the Chancellor. A dozen of the galaxy's most skilled and notorious bounty hunters are selected to compete for the mission – including the unforgettable Embo, who makes a return appearance. Cad Bane also enters the fray, and he's been keeping a close eye on "Rako." Can Obi-Wan prove his skills to survive to the finish, without revealing he's a Jedi Knight? And here's a promo image.